One thing is for sure: if a practice doesn't go well, it's the coach's problem. How do you fix it? ― Deborah Day, BE HAPPY NOW! Regardless of how busy I am before training, I always find a way to have something written on paper for that session. Most times it's a very formal plan, other times it's scribbling and doodles and lines. But I always have something to refer to. Can I run a session without a written plan? Of course. But that's not very smart. In the chaos that sometimes develops from the presence of a group of youngsters, you can easily forget your sequence or to include coaching points along the way. I always have my paper tucked into the waist of my shorts ready, if/when I need it. list possible detours if something is not available (players/equipment/space). This is called "thinking on your feet", but it's easier if you have ideas already. Coaches will have their personal preferences as to how they prepare for training, but something tangible, in writing, is a must. And it has to be on the coach while they are on the field. Leaving it in your bag is half a job. Did you look and sound like a coach? Was the session enjoyable for you and the players? Why? Why not? Did the players improve? Did the team improve? How will your observations today affect your next session? For me, I know how I feel after a good session and that's the feeling I want during the drive home. When I don't feel right, I look inward to find out why and work to fix it next session. If I have a good session I work to build on it next time. Reflection is not an option if you're looking to improve as a coach. Honest reflection is your biggest tool in running a continuously improving program. Create action points from your reflections to help plan your next session. Nobody would ever guess that you prepare more as the age group gets younger. Yesterday was the last U4 Active start session for this group. It was my third with them, but they had 8 as a group. I am not afraid of professionals, college players or youth travel teams. U4 players keep me on my toes and nervous enough that I come to the field with nothing less than my very best. The LTPD recommendations for this age group are useful and very applicable. Parents being involved on a 1v1 level is essential for success with U4. Parents want to learn what you're showing the children. Children do want their parents close by. The level of participation is high when parents are involved. One ball per player is the most basic and important requirement. Spending time on physical literacy is a must. Children that young do not total control over their bodies. Some can barely run in a fluid motion. Preparing for a U4 session requires time and effort as you have to make sure the session is busy enough that the players do not disappear on you. These children are not ready for games. Getting them to play 1v1 with parents and understand their direction of attack is a major undertaking. This week, in addition to activities they were familiar with, we introduced tumbling (from a stand still and a short run) and dribbling with some direction. The dribbling was a bit of a challenge but we got it on the table. For those who return, they will see it more often and we will build on it every week. There was still a lot of time to manipulate the ball and learn basic soccer movements. My goal for the next set of sessions after Christmas is to work with at least 8 of the parents and have them attend the Active Start course, so they can start delivering sessions when summer arrives. What cultivates creativity and imagination? Sometimes, to help shape our coaching philosophy, we need to access information that has nothing to do with soccer. Who has imagination? Who is creative? Are you born with it? Can you learn it? Does it run in your family? Will Lionel Messi's newborn son be just as good as he is? I don't believe everything is "natural" or that you are "born with it". Many stories you read about the great players have a similar theme ... lots of practice and exposure (formal and informal) in an environment that is crazy about the sport they excel in. The problem with accepting that much of that may be learned is it puts more onus on coaches and teachers to ensure the environment around children is always positive and nurturing. For some people, that responsibility is too much. My opinions about imagination and creativity do not have their roots in soccer, but affect how I think players should be coached. It's always been topic that has captured my interest. "...imagination is based on your past experiences and perception of reality..."
We want our players to solve problems in game. Be imaginative. But how can they if they've not seen the same situation before, several times? Problem solving is about imagination. A positive environment makes you feel better about what you're doing. A solid fundamental base gives you the freedom to act in given situations. Playing small-sided-games (4v4, 5v5, etc) exposes you to more situations more often that relate to bigger field game situations. With solid fundamentals and previous exposure to a certain situation, a player is in a position to be more effective during a similar game situation. 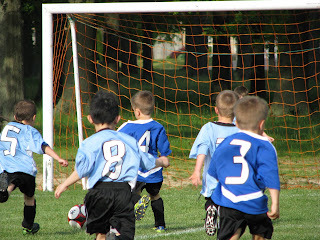 The science and stats of small sided games varies from source to source. But the long and short of it is: more touches, more situations, more combinations with teammates, more confrontations with opponents, more goals, more learning. To learn more about why small sided games work, you need to learn more about imagination and creativity as it relates to anything. I've read several good books and many articles on development and talent that have little to do with soccer. The Outliers By Malcolm Gladwell and The Talent Code by Daniel Coyle were my favourites, but constitute only a small amount of what I've read over the years. I would also refer you to two excellent podcasts on CBC Radio dealing with Imagination. These are from the radio show "Ideas". They are about an hour each but well worth the listen. There is an old saying "Without fundamentals, there can be no creativity". Most of the literature I've read discussed development and technical proficiency as a way of freeing the person to be able to express themselves using the techniques learned. Simply put, if you don't have to worry about whether or not you have the ball under control, you are free to put more thinking into what you want to do with the ball. The podcasts were a little more cerebral, but said the same thing in a round about way. They dealt with the theme that imagination was based on your past experiences and perception of reality. Solid fundamentals give you greater confidence and a positive feeling about what you're doing. A positive environment gives you a positive perception about what you're doing. More exposure to what you're doing in a positive environment gives you access to more situations and problems that need to be solved, building on your past experiences. Positive scenarios around failures builds your experiences even more. You can imagine/foresee more options about how to solve a current problem because of your memories on how you resolved similar problems and your confidence in that you have the tools to solve the problem. The environment and culture is HUGE in my opinion. There is a reason that not many hockey players come from Mexico or baseball players come from Uganda. It;s tough for a hockey player in Mexicoto build a love for the game if there is little hockey around him. Your job as coach is to nurture as many aspects of a player's toolbox as you can and set them up to be in positions of having to solve problems, all in the proper environment. You don't have to wonder why the player who rarely plays has little idea of what to do and even less confidence in whether or not he/she can do it at all. How can they succeed if they have had little to no exposure to a situation? Then deal with it under pressure? P.S. The podcasts have a wonderful section on how imagination also shapes or kills hope. It's really good. On Wednesday, I delivered a Game-Activity-Game session to our coaches at the club. I'll spare you the in-depth explanation of what GAG is. 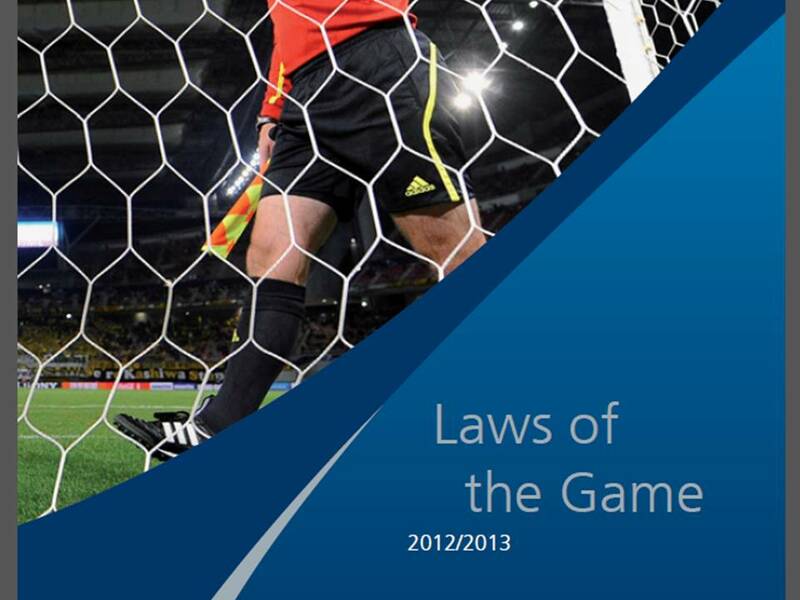 Here is a good explanation by the CSA's Ray Clark in PDF format. Here is a good video explanation conducted by the OSA and York Region's Bobby Lennox during our Learning Facilitator Workshop of 2011. I am in this with the red track top at the beginning. Last night, I was caught a bit off guard. We usually get a varying amount of coaches out to these things, between 5 and 10. Last night we had about 25 coaches out. We've made a habit out of bringing in guest teams to ensure we have a session to demo. The guest team were the 1998 girls. I always enjoy working with this bunch and their coach, Erik Opala, is a great guy and a super coach. Had I known this many coaches would have shown up, I would have run the session with the coaches on the field. I think we would get more out of the session with coaches directly on the field. We had good questions but, more important, we had good discussion on the side how to apply this to their specific teams. Here is my take on the GAG model: if you are a new coach, you can use the model to set conditions during the Activity part to bring out a facet of the game you want to improve and get a bit more out of your team. If you are a very experienced coach, you can get a heck of a lot out of your team using GAG. GAG allows you to get more game time in your sessions and instill some new ideas directly into the context of a game situation. There is a time and place for a GAG session. It doesn't replace all styles of training, but is a very effective addition to your catalog of sessions. 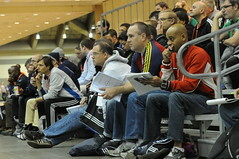 Another observation Rob Lalama and I shared was how many new faces we have coaching at our club. A lot of nice people who are very interested in delivering a good program. I would like to see more females involved so we'll have to keep pressing for that. I look forward to our next coaching session at the club and I hope to use the coaches on the field. Sabrina D'Angelo is U20 Player of the Year! Welland's Sabrina D'Angelo was named the Canadian Soccer's U20 Women's Player of the Year! Read the news here. Sabrina is the benefactor of her own hard work and determination. As a graduate of the Welland Soccer Club, we are ecstatic to have her name associated with us. Congratulations to Sabrina and her entire family for the great recognition. Sabrina's father, Gerry, is our goalkeeping coach at Niagara College. Welland is very proud of her. On Saturday morning, with the continued help of the parents, we had a very productive session. 12 players and 12 parents for 50 minutes. I think that last week parents thought I was a little crazy for having every player with an adult at a sports session. They were supportive, co-operative and helpful, but I think they were still wondering what I was doing. By the end, we were on the same page. Today they were with the program from the first minute and the progressions went smoothly. 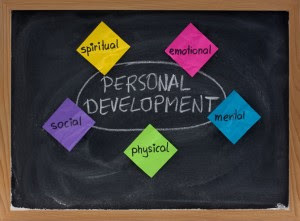 The Active Start stage of LTPD is one of the most important, in my opinion. It sets the stage for a patient and nurturing training environment. It also helps parents understand that they need to remember what age their children are and what's appropriate in terms of information and situations. The parents worked hard today. :) Some were sweating and they were whooping it up with their children and the other players. MOST IMPORTANT. The children have the person who loves them most close by and are comfortable doing all of the activities. So you get a full session from each child. The session stays organized. Easier to coach. Parents are directly involved in their child's activities, learning the "why" and "what" about your program. Parents are the lifeblood of grassroots sports. Involving them may lead to expanded interest in the organization and their desire to serve in the future. Some parents who thought of coaching but were unsure might develop the confidence to step up. This week we added a few more physical literacy exercises and parent-child ball sequences. One main thing I added today was a little more running. A lot of young children are still learning how to run and stay balanced. A major change from last week was the game portion. I did not do a 3v3 or 4v4 game today. Instead we had a marked off area with 2 goals on either side. All of the children played 1v1 with their parent and had 2 goals to score in. I felt a lot of the children were afraid to play but I knew they wouldn't be afraid to take the ball from their parent or try to keep it away from them. We added a few more drink breaks. We also made sure we had more goal celebrations, cheering and high fives and the parents did a great job with that. I didn't stress that enough last week and I saw how it really gets the players going. I've learned that the success of Active Start is a combination between a coach who believes in the philosophy and parents who are ready and willing to help and keep the message consistent. The parents hold the power in this one. If they start pushing for games or adult style drills, it will be pre-2010 all over again. If the coach does a good enough job then they will see the benefit of patience. Parents always have to remember and support ... "the right information at the right time". Although I've coached U4s before, I really enjoy employing the LTPD philosophy in the program. I look forward to delivering more sessions and sharing this information with other coaches who attend. Never say "it's only house league"
Why do people feel they need to slot the house league experience below "rep" or "travel" teams? True success as a sports stakeholder is realizing the best place and situation for a child to develop and enjoy themselves. It may be rep, it may be select or it may be house league. Remember, the right level, the right coach at the right time. House league and grassroots sports are the backbone of all sports in Canada. Because a child may not be at the level to win a spot on a rep team, it does not make them any less a participant in that sport. The level of play and execution may differ but that does not minimize the passion. Whether you are the right defender on a rep team, the striker on a select team or the centre midfielder on a house league team, you are as much a footballer as Lionel Messi. The same applies to coaches and managers. "At the end of it all, 99.99% of youth players, regardless of level, will be playing in the same beer league. And that's OK."
House League/Grassroots soccer has just a big a portion of Ontario and Canada's Long Term Player Development as everything else. The "Active for Life" stream of the philosophy is very important. Don't fool yourself. The sports world is driven by what happens on Saturday mornings in every sport across the country. A parent or player shouldn't feel house league is a lower level of sports experience than travel. It's wrong for a sports organization to treat house league as an after thought. It's wrong for sports organizations to not offer their house league coaches support. It's wrong for sports organization to not offer meaningful pathways for house league players who are looking to make the transition to travel. It's wrong for organizations to not have proportional representation from house league on their boards. It's wrong to let facilities assigned to house league fall into disrepair. It's wrong to give house league what's left over in terms of time at facilities. It's "bad business" for groups to discount the importance of their grassroots program. I like how the Welland Soccer Club has handled house league and the indoor program has been almost exclusive to house league. 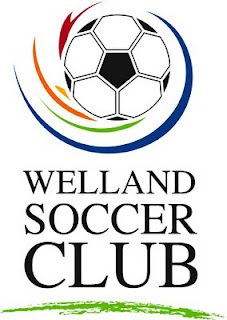 There is another club in Welland, Plymouth Park Soccer League, who do a good job as well. People who know me will tell you that, in spite of my personal involvement with travel soccer, my favourite place is the Welland Soccer Club on Saturday mornings. As a final note: At the end of it all, 99.99% of youth players, regardless of level, will be playing in the same beer league. And that's OK.
MLS and NASL ... are we there yet? In 2013, Major League Soccer officially outlives the defunct North American Soccer League. There have been countless attempts to bring professional soccer to North America, but the NASL and MLS are the two biggest stories. I have a personal attachment to the old NASL. In 1981, my youth team from Port Colborne was selected as the ball boys for the Soccer Bowl held at Toronto's Exhibition Stadium. The Chicago Sting played the New York Cosmos. My friend Mossimo and I were placed behind the one goal and I got an up-close view of my favourite player, Giorgio Chinaglia. The Sting won that game in a shootout after playing to a 0-0 draw. The old North American Soccer League ran from 1968-1984 and, in my opinion, this league was an amazing story. It managed to wiggle it's way on to ABC as a weekly national broadcast in between broadcasts of Major League Baseball and early season NFL. The NASL sold soccer to North America, period. Big name players came to North America to play out their final days. Pele, George Best, Johan Cruyff, Giorgio Chinaglia, Roberto Betega, etc etc etc. You can criticize the actions of certain owners, but you can't argue that soccer grew at a crazy rate during the NASL days and those people who put their money where their passion was are soccer heroes. A lot of people had NASL jerseys and t-shirts and all of my soccer friends had favourite teams and players. EVERY SPORTS FAN knew details about the New York Cosmos. "the final nail in the coffin was the USA not getting the 1986 World Cup after Columbia had to withdraw"
Teams played in cavernous football stadiums and modified baseball parks. You could see the football and baseball markings on the field along with the soccer lines and people did pay to watch. The highest average attendance was 14,201 in 1980. The league also has a high 24 teams that year. In 4 short years the league went from 24 teams to 9 and average attendance dropped to 10,759. In 1984, the league played its last game. A lot of things led to its death, but the final nail in the coffin was the USA not getting the 1986 World Cup after Columbia had to withdraw in 1982 because of economics. Mexico was named the new host. Experts agree that awarding the USA the 1986 would cup would have been the boost needed for continued growth. Different leagues have come and gone in both Canada and USA but the NASL was the first to take it up a level and have some kind of exposure and staying power. All of those leagues before and after the NASL were instrumental in keeping the market active and laying the ground work for MLS. MLS was founded in 1993 and played it's first season in 1996. The announcement of the USA being awarded the 1994 FIFA World Cup Finals played a huge role in the league birth. In fact, the league's formation and planning for the 1994 World Cup was all under the same umbrella with US Soccer. Major League Soccer is entering it's 18th season in 2013, officially surpassing the life of the old NASL. MLS currently has 19 teams and the average attendance in 2012 was 18,807 over 323 games. Most teams have soccer specific stadiums and that is a boost to credibility and a testament to the owners' collective commitment and confidence in soccer. The occasional big name still makes the jump over and big name friendlies are always being played. This league is for real and sustained interest in North American soccer and the USA's perennial qualification for the FIFA World Cup keeps adding fuel to the fire. Each team is adding full academy systems to their organizations. In Canada, the three MLS youth programs are constantly contributing talent to our younger Nation teams. The caveat with MLS is the ownership structure and how youth academies fit into the system. They don't. Sooner or later MLS will have to be independently operating teams truly competing with each other and profiting from selling players to bigger clubs. There is also a quality issue on the pitch (players and officials) that fans are wanting to see. There is also international criticism of not taking days off for international matches and a true relegation/promotion system. "It's like a smouldering fire that people kept trying to fan into a flame." Does the MLS owe a debt of gratitude to the old NASL, the players and those who invested in soccer? Nobody can separate the two leagues in terms of a foundation being laid and a market being present. Having the courage to invest in big names and bring Pelé over moved soccer into the mainstream. You can also qualify the effect the 1986 World Cup would have had on the NASL by the fact that the 1994 World Cup was the catalyst for MLS. The defense of the ownership structure is to protect the league from spending it's way out of business. Locally, Toronto FC fans wait for success. And wait. And wait. A lot of people have emptied their pockets over the past 100 years in hopes of bringing professional soccer to Canada and North America. Every major city has somebody who tried to champion high level soccer. Former Toronto Maple Leafs owner Steve Stavro is an example of such a person in Ontario. There are also countless people who have owned teams in the Canadian Soccer League, National Soccer League and CPSL. There are countless stories of passionate fans, broken hearts and bad investments and they truly deserve a space of their own. It's like a smouldering fire that people kept trying to fan into a flame. From a marketing point of view the story has been consistent : Who will be the first to find a way to convert all of those soccer players in North America into paying customers. But TV coverage of soccer is awesome, brand names and globally recognized teams are seeing their jerseys in our classrooms and municipalities are investing in more pitches. So are we there yet? Is professional soccer here to stay? I think it's safe to finally say "YES ... maybe", despite it currently being in an unorthodox, not truly 100% competitive structure. Working with the early bloomer and preparing the late bloomer. Another justification for Long Term Player Development. "Get the ball up to Joey ... go, get it UP!!!! .... go Joey GO JOEY SHOOT SHOOT .... AHHHHHH Joey .... Ahhhhh ..... don't worry Joey , you'll score next time .... wait ... yes .... Get the ball back to Joey .... why didn't you give the ball to Joey??? " Eight smaller players. One big, fast striker. Everybody's job is to get the ball up front to the big boy. His job is to run and bury the ball in the goal. He will score 1 of every 5 chances because he can't strike a ball while he's running. He will run a lot because the passes are all over the place with no real purpose other than to go forward. Nobody has learned a thing because the team is winning games and the coach, with his nice jacket and two trophies, is feeling successful. This will keep working .... until you play a team with TWO fast players. Everybody needs to remember that everything changes at 13/14 years old, for boys and girls. The growing player starts to become the adult they're going to be and speed and size start to even out. So what will separate players at that point? Technique, skill and smarts. Have I seen a player who dominated at age 10 disappear at age 15? Have I seen a player who struggled to make a team at age 10 dominate at 15? Playing at the right level in the right situation at the right time with the right training helps the early and late bloomer compete once everybody catches us to each other. Keep in mind that not every athlete is a late or early bloomer. Some are average the whole way through. Parents may start to "dream" a little too early. Child may have trouble dealing with competition when other players "catch up"
May develop an attitude of "what's the point of trying?" Don't fool yourself. Both the late and early bloomer are feeling pressures that are uncomfortable. So the problem is simple. How do we best prepare everybody to compete when our physical stature is no longer the main separator? When the defender is now as fast as your striker, how does your striker beat him 1v1? How does the player who scored by putting the ball over the keeper's head score now the the keeper is taller? Keep everything enjoyable and progressive. Frustrations from games and crazy sideline talk needs to be wiped away by enjoyable environments. We want those players to be training and playing while and after their bodies are going through changes. Don't let the early bloomer rest on their early successes and insist they focus on mastering technique and playing "smarter". Encourage the early bloomer to use their tools to bring teammates into the play. If an early bloomer is smart and technically sound, your entire team will benefit. Find occasional situations for the early bloomer to step in to that challenges their mind and body (playing higher levels or with older players). Don't let the late bloomer feel like they are just a supporting player for the better players. Give them roles that suit them today, building confidence in them for tomorrow. Raise the level of physical literacy among all of your players. During the periods of growth spurts, continue to train the muscle groups to keep co-ordination levels where they need to be for soccer. Technique Technique Technique - Ensure all of your players are comfortable with the ball in as many situations as possible and at full pace. Do this with and without opposition. Problem Solving - continuously give your players problems to solve involving the technique they are using. Mini competitions at training, small sided games with conditions, individual challenges, etc. Promote and encourage ambidexterity. This is necessary for the successful player and ties in with physical literacy, but is also a great confidence builder as a child. Imagine how they would feel after a goal or assist with their weaker foot. Revolve positions to give your players exposure to as many situations as possible. At training, use small sided games to force players to find ways to compete without the convenience of their size or speed. Devalue competition or decrease the number of pressure situations you put your team in. Maybe skip a tournament and find festivals to play in. This takes pressure off stronger and weaker players and makes it easier to have them feel comfortable in trying new positions. If you've amassed any kind of coaching experience, you will have stories about late and early bloomers quitting sports at around age 15. Learn about LTPD and you will see that what they emphasize at different stages of a child's development supports the information above. And it doesn't apply only to soccer. Your goal is that all of your players are socially, emotionally, mentally and physically prepared to compete and enjoy soccer in their teenage years. If you get them to that point, you've succeeded. How do you know if your session plan is working? What do you do if it's not working? It's a scary moment for an inexperienced coach. You feel so good about your plan and reality sets in. Players are lost, not following the drill or bored. NOW WHAT? We've all seen it. A coach is running a drill. It's not going well, so he yells, as if to force it to succeed. Oh, it's not working still? OK, run 5 laps then we'll see. Still? OK, no game at the end because the drill didn't work. What one person feels is motivation another sees as losing control of their session. Questions #1. What is the main objective of your session? Hopefully it's that every player improves and enjoys themselves. The main thing in keeping yourself ready to adjust is to realize that if a training session falls apart, it's up to you to fix, and quickly. Remember, if you are in North America, you see these players 1-3x per week in an environment where the players are not playing much on their own. You need to get as much "soccer" in as possible during your time with them. Know your players. Is your exercise appropriate for their age? Do any of your children require differentiated instruction. It's OK to ask parents at the beginning of the season "Does your child have an "Independant Education Plan" at school that might help me be a better coach for them?" OK. First, your session plan. Have your progressions listed. Know what you're looking for before progressing. Know what you are looking for to determine if you have success. How will you know if it's working or failing if you don't know what you're looking for? Understand where your players are coming from before training and make sure your session plan takes that into consideration. Were they all at a teammate's birthday party? Are they on a 5 game losing streak? Is it the last or first week of the school year? Use LTPD as a guideline to see if what you're trying to achieve is relevant to their age. Most players aren't "getting it". You are losing their attention - consider the possibility that you are talking too much, instruction is too vague (no demonstration? ), too complicated or the topic is not relevant to their age group. Avoidance of a drill or stepping to the back of a line, faking an injury or cramp, etc. Some players will avoid doing something because they don't understand it. Watch for that and figure out why. READ THIS! MAKING ADJUSTMENTS DURING TRAINING IS NOT A SIGN OF WEAKNESS OR INCOMPETENCE. IT IS A SIGN THAT YOU WANT TO GET THE MOST FROM YOUR PRACTICE AND HAVE THE ABILITY TO RECOGNIZE TROUBLE AND SAVE YOUR SESSION FROM FALLING APART. Change the conditions or challenge of that part of your session. If they can't get 10 straight passes in 5v2, decrease it to get success then move back up. If they can't do the hurdles, adjust the distance. Look inwards first before yelling. Even if you are falling behind schedule and a drill is not yet succeeding, but the players are still working and interested, don't progress to the next one. The session plan schedule is useful, but you have the final say. Change your teaching method. Know and understand different methods such as (i) Command method (ii) Question and Answer method or (iii) Guided Discovery. If things are falling apart in a big way, go to your small sided game and try to add some conditions in there to bring out the topic. Adjusting a session in progress takes experience. You have to think on your feet and have the confidence to make the change and carry on. Some of these points sound very obvious, but some coaches get so stuck on what's planned that they feel pressure to follow it to the letter. As you read this you might be thinking that I am touching on session planning, or body language, or reflection, or many other topics. The answer is yes yes and yes. Everything comes together to bring about a great session and to progress to another great session. It's not what you say, it's how you say it. It may be a cliché, but it's very true. A definition of body language found on Wikipedia.org is: a form of mental and physical ability of human non-verbal communication, which consists of body posture, gestures, facial expressions, and eye movements. Humans send and interpret such signals almost entirely subconsciously. As a coach you have no choice but to learn as much about this as anything else. It's a very powerful aspect of communication that very few people have complete control over. It makes all the difference when starting conversations and gaining trust. It can also be used to manipulate. Your body language can reveal the truth that your words are trying to hide. Or it can distort the intention of the words you've chosen to relay. It's estimated that 85-93% of what you say is conveyed through body language, while words only deliver 7-15% of the message. Think about that if you are trying to rally your team back into a game or getting them to pick up the pace during a drill. Think about HOW you deliver your message. See it for yourself in front of a mirror. Take a sentence that you would say during a training session or game and try to say it different ways with different body gestures. "That was a nice try", "Are you playing today?". Try slouching, standing up straight, hands in and out of your pockets, head up/down, frowning/smiling. Now change which word you emphasize and even add a sarcastic flare to a word. See how the message changes. Picture this: you're at a party, walking up to the host, shuffling your feet, hands in your pockets, with a sad look and your head down, shoulders dropped, let out a *sigh* and say in a monotone voice "Thanks for inviting me. I'm having a great time." See how convincing you are. So what does this have to do with coaching? Everything. It's your #1 non-technical coaching tool. Positive body language tells your players "trust me, I know what I'm talking about". As a coach you are trying to get the players to buy into what you're teaching. Who wants to learn something from somebody who's not excited to teach it? Are your relationships with your stakeholders healthy? The political end of coaching should never be ignored. Now that it's off season you have to think back and ensure all of the relationships around your program are in order. Your players are your number one stakeholder and always your primary concern, but reality dictates that there are other people involved who need attention. If you neglect any of the interested parties, you're asking for trouble. If you take the attitude that your one and only job is to coach the on-field portion, you're mistaken again. They can't be allowed to affect your tactical/player decisions, but your actions and conduct need to be at a level that they are comfortable in their continued support of your program, with you as the coach. On the flip side, you also need to be comfortable with their demands and conduct. This is not about kissing anybody else's rear end. This is about everybody making sure they are comfortable with the other parties so the on-field coaching and positive systemic support can continue uninhibited. I've watched good coaches, before my very eyes, implode because they chose to operate in a bubble instead of a community. Technical and tactical knowledge is good, but it's definitely not enough to succeed. There is a political side to coaching that is probably the most difficult part to master. Reflecting on the past U13 season is very difficult because I still can't figure out what happened. I've started this reflection at least five times. This was my third year with this group as a head coach. The first two years (U11 and U12) we made progress. This year, not so much, but in a weird way. If you came to our sessions, things were going well. Attendance was good, players were ready to work and we were moving forward. From tryouts until our last practice, things went well at training. I stand behind the training that was delivered. When it came time to compete, that was a different story. Getting the boys to even work through a warm-up was a challenge. There was no disrespect or discipline problems, there was just this lack of willingness to get into game mode. Perhaps a new voice would change that. Most coaches complain that their players do not come to training as focused as they do in the games. For us, it was the reverse. If we played as well as we trained, it would have been a different story. At training shots were driven, chances were taken 1v1, creativity was abound and challenges for loose balls were competitive. The year was enjoyable and the boys are a great group of guys. They were friendly and spent time together away from soccer, and that is always one of your goals. But I still have to look inwards as to why they did not seem interested in competing. I refuse to just say "They were not a good team" because it was more than the score line. It's my third year and I couldn't motivate them to play. What I was selling was not what they were interested in buying. At U13, other boys are getting big and they were not ready/willing to challenge bigger opponents. As a whole, we were the smallest team. I was too demanding and they were afraid to play. I may not be the right coach for this group. We had some injury problems, but that would only affect the score, not the enthusiasm at matches. I am still asking myself questions before laying a final decision if I am returning or not. My son has asked to switch sports for the last few years but this year declared his intentions in BOLD PRINT with no ambiguity. It's funny because this was his best year, personally. I coached before my sons played and will coach after, so my thinking on this team is independent of him. Did I present the information in a way they were able to learn from me? At training, definitely. At games, I don't believe I did. Did they improve as individuals and as a team? As individuals, I believe so. As a team, no. Did the players enjoy themselves? Do they still want to play soccer? Not sure. Some are not playing next year. 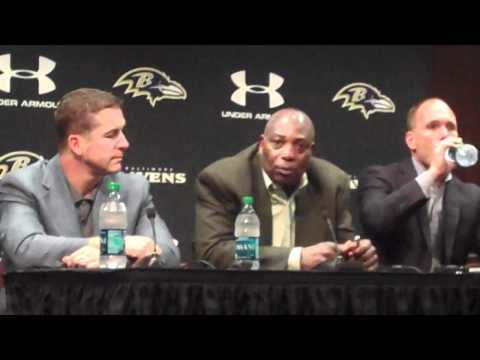 Are they motivated to play with me as the head coach? I don't believe they are at games. At training, yes. Can I run an honest and open tryout after coaching the same group for 3 years? I am not afraid to make changes after 3 seasons. I made changes with my last group every year for 8 years. Even after writing this, I am still unsure of how I would sum the season up. Many parents say they would like me to come back, but they were not with us during pre-game, warm-up, half-time and post-game. It was not always fun and I don't blame the boys. This was my first time in 24 years that I didn't have a team's attention. If one is distracted, it might be the player. If 15 are distracted, it's the coach. Games are part of the equation and I can't consider this a job well done unless the boys wanted to be there for training and competition. I am still deciding what to do for next summer.